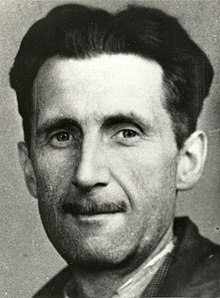 George Orwell (25 June 1903 – 21 January 1950) was an English dia during the British Empire's rule of India. He is best known for two novels that he wrote in the late 1940s, Animal Farm and Nineteen Eighty-Four. In those works, he said that totalitarianism, especially Stalinism, was very bad. Orwell fought in the Spanish Civil War with the antifascist troops. These troops were against the dictatorship of fascist governments. Orwell died of tuberculosis in London. Eric Arthur Blair was born on 25 June 1903, in India.
. His great-grandfather Charles Blair rich gentleman who had married Lady Mary Fane, and he was supported by money from slave plantations in Jamaica. His grandfather, Thomas Richard Arthur Blair, was a clergyman. His father, Richard Walmesley Blair, worked in the Indian Civil Service. His mother, Ida Mabel Blair, grew up in Burma. Eric had two sisters. Marjorie, his first sister, was five years older than he was. Avril was five years younger. When Eric was one year old, Ida took him to England. Eric grew up with his mother and sisters. Except for a short visit, he did not see his father again until 1912. The family moved to Shiplake before World War I. There, Eric became friends with the Buddicom family, especially Jacintha Buddicom. They read poetry and hoped to become famous writers. At this time, he also liked fishing and watching birds with Jacintha's brother and sister. When he was five, Eric was sent to a convent school where Marjorie went to. It was a Catholic convent. His mother wanted him to go to public school, but his family was not rich enough to pay for it. Ida's brother, Charles Limouzin, was asked to help find the best school to help Eric prepare for better things. He suggested St Cyprian's School in Eastbourne, Sussex. Limouzin, who was a good golfer, came to know the school and its headmaster at the Royal Eastbourne Golf Club. The headmaster helped Blair win the scholarship to pay for his education. He also let Blair's parents pay only half the usual amount of money. However, Blair hated the school. ↑ Crick, Bernard (2004). "Eric Arthur Blair [pseud. George Orwell] (1903–1950)". Oxford Dictionary of National Biography. Oxford, England: Oxford University Press. ↑ 2.0 2.1 Stansky, Peter; Abrahams, William (1994). "From Bengal to St Cyprian's". The unknown Orwell: Orwell, the transformation. Styanford, CA: Stanford University Press. pp. 5–12. ISBN 978-0-80-472342-8. ↑ Bernard Crick. George Orwell: A Life. Secker & Warburg 1980. Stansky and Abrahams had suggested that Mrs Blair moved to England in 1907 because of information given by Avril Blair remembering a time before she was born. ↑ Alaric Jacob. Sharing Orwell's Joys, but not his Fears in Christopher Norris (ed.) Inside the Myth. Lawrence and Wishart. 1984. This page was last changed on 6 March 2019, at 19:20.